The Mueller special counsel report was delivered to the DOJ today where a senior DOJ official said Mueller is ‘not recommending any further indictments”. There is a reason this site barely posted on the Russian Collusion conspiracy, it was crap from day one. I was not going to be a party to the circus the democrats were orchestrating (with the hopes of impeaching Trump), wasting my time explaining why they’re wrong. For instance Mueller’s very appointment was illegal. A crime must be committed/ identified for special counsel to be appointed, that never happened here. Rod Rosenstein having his hands deep in the cookie jar with his involvement of Uranium One had all the reasons in the world to get rid of POTUS by appointing his FRIEND Robert Mueller who appointed all democrats to his team, many Clinton supporters. During the 2 years of Mueller probe not one person was indicted for colluding (collusion is not a crime, second reason for not covering this day in – day out) with the Russians. ALL the individuals on the left citing admin officials or those with ties to the Trump campaign (ie Flynn, Manafort, Cohen) who were indicted and/ or prosecuted by Mueller, leave out the fact said charges are over UNRELATED process crimes, for everything from lying under oath to not paying their taxes. What you have here is an outright FAILED COUP against the duly elected President of the United States, carried out by elected democrats, Deep State operatives within the DOJ/ FBI, members of the media and special interest groups. All the individuals involved need to be publicly shamed, removed from whatever seat of power they hold. The media, especially the entire degenerate roster at CNN, should be discredited and barred from any reporting (yes that means kicked out of the White House Press Corps) what they consider news. Democrat voters, YOU WERE LIED TO, why do you support these monsters? 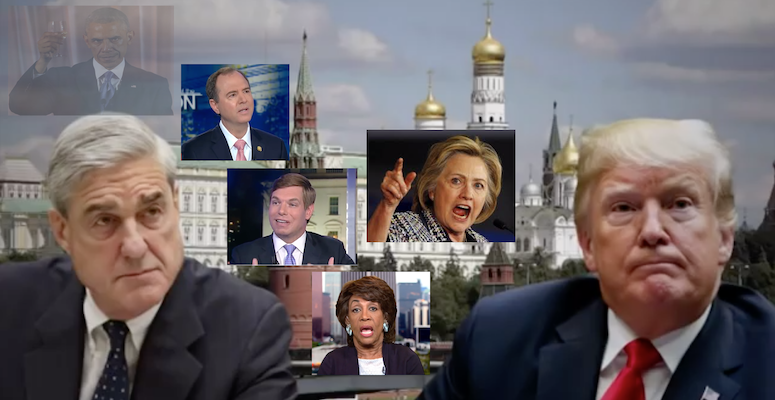 Reps Schiff, Swallwell, Waters, A Greene and several others who ran to the cameras daily adamant Trump was guilty, he should be impeached and there was a mountain of evidence against him should be removed from office. These people LIE, have no business legislating law and making policies for we the people to live under. Frankly they’re quite dangerous where we can only imagine how unhinged they’ll become now that their guy Mueller didn’t deliver. As a matter of fact when they continue the with hunt against POTUS in Congress expect them to go after Mueller! We haven’t even talked about obama and his regime who are direct players in this failed coup, the FISA and other abuses of power, nor the radical democrat party controlled media! Actually going scorched earth is an understatement. These people need to be run out of the business never to be seen or heard from again. They are just as complicit with the attempted coup as those who carried it out. What the left and the NeverTrumpers have put this country through has brought us a step closer to violent conflict. People, let’s be honest Trump supporters, have been attacked verbally and physically for supporting the President. They’ve been called every name in the book including the most stupid “Russian Bot”, now a proven lie. America is more divided, and the vitriol is far worse than it was when a leftist tried to swing the balance of power in an attempted assassination of approx 30 GOP lawmakers in Alexandria, VA. Now that Mueller didn’t deliver it won’t be a surprise if another leftist monster launches another attack. That’s what they do when they can’t win an argument, they turn extremely violent (there’s plenty of video proof out there).